The tai chi symbol is also known as the yin yang symbol, which is the epitome of balanced chi energy. While it looks simple, the tai chi sign has multiple elements that are all deeply symbolic. There are specific symbolisms within the tai chi design, especially the black and white tear drops. The two tear drops represent the male (yang) and female (yin) properties of chi energy. These properties are found in all matter since chi exists in all things. Male energy is light (white) and active. Female energy is dark (black) and passive. When combined in a balance of power, these two energies create harmony or what is known as chi. This is the same balance of energy that feng shui applications can achieve inside and outside your home. 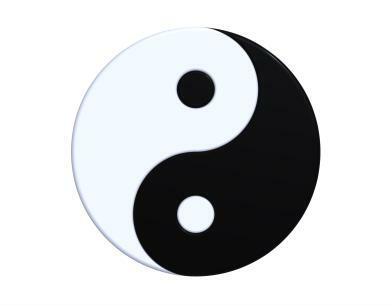 When examining the yin yang symbol, it's easy to understand how day (white) and night (black) are depicted. Each reigns for an equal (balanced) amount of time. Each begins small then grows larger until the next phase begins. Day gives over to night just as night must give back over to day. This is perfect harmony of elements. Both day and night have specific attributes and properties. The day has the sun and the night has the moon and stars. Certain animals belong to the vibrational quality of day while others come out only at night. The Circle of life concept of cyclical nature is as ancient as humankind. 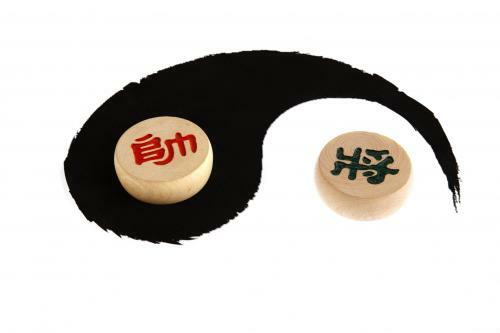 This cycle is symbolized with the shape of the tai chi emblem being round and containing the positive and negative energies of the yin yang symbol. This symbol further demonstrates the philosophy of life, death, and reincarnation. The eternity of the soul is cyclical through many lifetimes of birth, death, and rebirth. The yin yang symbol of two teardrops creates the sense of movement. The left side of the circle is filled with the white teardrop with its bulb at the top as though it's ascending. The black teardrop descends with the bulb shape located at the bottom of the circle. This creates the illusion of a clockwise movement. In addition to the male and female representation, the tai chi also embodies the Ten Thousand Things, which includes the four major compass directions and the four seasons. Directions and seasons are vital to the creation of beneficial feng shui. A feng shui practitioner orients her efforts to be in harmony with the energies of these directions and seasons. The symbol of balanced chi with yin and yang in proper alignment is the ultimate depiction of the natural harmony found in nature. In feng shui, the south is considered to be the most auspicious direction. Unlike Western culture that orients all maps and life to the north, the Chinese, fathers of feng shui, place south at the top of their maps. The southern direction is the most beneficial orientation for growing crops since it affords farmers the most hours of daylight. This is an excellent example of the complexity and logic that governs the art of feng shui. This southern orientation of the top of the circle makes it easy to identify the other directions within the yin yang symbol. The sign for tai chi also gives an artistic expression of the four seasons and explains the teardrop shapes found in the yin yang symbol in a different way. Spring is the season when new life bursts forth. This is represented in the white (yang) teardrop of the tai chi that starts as a tail-shape. This narrow point expands as it grows toward the top of the circle (south). This bulb portion represents the yield of summer growth. Summer days fade into fall as the yang energy gives over to the yin side of life. This means shorter days and more darkness. The temperatures also go from hot to cold as fall gives over to winter. This transition is represented by the teardrop increasing into a bulb shape at the bottom of the circle which is the north direction. This is the exact opposite of the white teardrop that represents spring and summer. The cycle then begins again in an eternal process. This is how the yin yang symbol becomes one of eternity. Another symbolism within the yin yang depiction is the carp. The teardrop is also associated with the auspicious symbol, the koi (carp). The koi is one of the most recognizable feng shui symbols and with good reason. The carp has been used as a beneficial element in the growing of rice during the spring and summer and then used as a food source for the farmers during the fall and winter months. Each teardrop has a small eye of the opposite color. This symbolizes the all-seeing eye of the wise carp. It further represents the truth that all things are connected and are a part of each other, making this a true symbol of perfect harmony. This is the authentic representation of tai chi. In your quest to find the right medium for your yin yang symbol, you'll run across many other variations of this symbol. Some transpose the positions of black and white with the movement changed to that of counter-clockwise. A few even turn the teardrops from a vertical orientation to a horizontal one. While these are artistic expressions of the tai chi symbol, they aren't the true representations of the flow of yin yang energy.